Back on Feb 5, 2009 I reported on this site how Sinopec was bidding in Mexico for a oil contract. Well... The Texan beast, Schlumberger has won the bid. Thought I would update. Developing countries in the region should avoid hiking barriers against imports and should instead deepen economic links with other poor nations to cope with the global economic downturn, a United Nations agency said. The UN Economic and Social Commission for Asia and the Pacific (UNESCAP), in a policy brief, proposed such measures to "ensure that the region can minimize the negative impact of the current crisis." A Philippine economist agreed with the recommendation to trade more with other developing countries but said demand might not be comparable with that of richer markets. But a pro-industry group countered this, saying the Philippines should hike tariffs at least to the internationally agreed ceilings to protect domestic producers. The UNESCAP report noted that "Developing countries still rely greatly on exports to the United States, the European Union and Japan to generate GDP (gross domestic product)." "Using intraregional trade as a cushion against the contraction of exports to developed countries will depend on strengthening domestic demand and restructuring it to support intraregional trade," the report said. Deepening "South-South" economic cooperation, or links between developing countries, may boost trade and also lead to the transfer of technology and technical knowledge, the UNESCAP report said. Mexico's Cemex (NYSE: CX) was once very nearly the emerging star of the international world of cement. But the company, recently on the prowl for new financing, has now discovered that the world has changed a lot in just the past few years. Cemex is the world's third largest cement company, behind France's LaFarge (OTC : LARGY. PK) and Holcim (OTC: HCMLY. PK). After a lengthy search for cash infusions abroad, it became clear that Cemex would have had to fork over an interest rate of between 15% and 20%, according to some reports, to sell its bonds last week. It'll therefore return to banks for a fresh supply of pesos. Unfortunately, Cemex is paying penance for a number of recent acquisitions. Its latest purchase was last year's $15.3 billion devouring of Australia's Rinker Materials. The deal gave the company exposure to markets in such places as the United States, the U.K., and Spain -- just in time to see housing and construction slowdowns put a big crimp on those nation's economies. In the wake of the deal, Cemex's net debt reached $17.8 million, or five times its most recent years' earnings before interest, taxes, depreciation, and amortization (EBITDA). Partly as a result, rating agencies Fitch and Standard & Poor's have reduced Cemex's bonds to a below-investment-grade BB+. Brazilian state-run energy giant Petrobras notified regulators late Monday that it found traces of oil in a test well drilled in the Reconcavo Basin. China's first helicopter club is signing up new members! Membership for what is being touted as the country's first private helicopter club will open this weekend, organizers said yesterday. 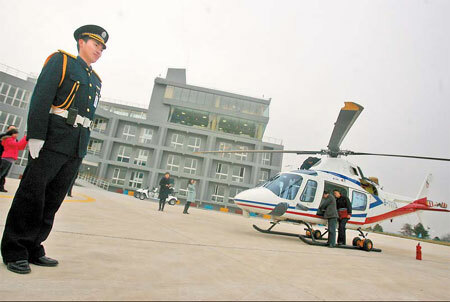 The club is affiliated to a private heliport opened last Saturday in Nanjing, capital of Jiangsu province, under the Ruohang Transportation Development Co.
"Our membership plan will be formally made known to the public this weekend and its initial terms for receiving application will be mainly targeted at those interested in flying or wanting to buy helicopters," Lu Yong, the executive director of Ruohang, told China Daily yesterday. Some interesting news in the field of “South-South Cooperation” arrived in my email box this evening. The underlying point is simple. Developing nations in today's globalized world are going to be looking towards one another for new opportunities more and more, and towards the developed world less and less... at least proportionately. The first Morocco-Paraguay joint committee meeting, which kicked off Monday in the Moroccan capital, Rabat, is an opportunity to strengthen bilateral co-operation at all levels and in all areas, Moroccan Foreign Minister, Taieb Fassi Fihri said. Speaking to reporters following the opening ceremony, Fassi Fihri recalled the kingdom's experience in south-South co-operation, stressing that king Mohammed VI takes great interest in this co-operation as a forum for a better exchange of expertise and sharing of competences. He underlined, in this regard, the two countries' desire to work together to deepen their political dialogue and strengthen co-operation in several fields, mainly agriculture, water and electricity, health, human development and poverty eradication. Co-operation opportunities, especially in banking, trade and investment, were also among the issues tackled by the FM, who stressed the importance of strengthening cultural co-operation as well between the two countries. On his part, Paraguay’s Foreign Minister, Alejandro Hamed Franco, who co-chairs this session with his Moroccan peer, said this meeting is “a new step” in bilateral relations. BUENOS AIRES, March 8 (Xinhua) -- Chinese business circles are deeply worried about the protectionist measures against Chinese products that the Argentine government has taken, a senior diplomat at the Chinese Embassy said in an interview published in La Nacion newspaper Sunday. "These import measures are discriminatory," said Yang Shidi, economic and commercial counselor of the Chinese Embassy in Argentina. The measures that Argentina has adopted since 2008 have affected many Chinese products and run contrary to the memorandum of understanding signed by China and Argentina in 2004, in which the Argentine side recognized China's market economy status, Yang said. Argentina calculated the dumping margin for the Chinese products on the basis of the prices of a third country, he said. "It is not fair," because the costs of raw materials and manpower as well as productivity in China are different from those of other countries, Yang said. TOKYO – Several Japanese companies, including Fujifilm and Panasonic, will develop new low-cost products specially designed for emerging markets in South America and Asia, the daily Nikkei said Monday. Faced with the fall in demand in its principal markets like the United States and Europe, Japanese firms have decided to target middle-class consumers in emerging economies like Brazil as a way of dealing with the global economic crisis, Nikkei said. China and Peru will be officially sign their Free Trade Agreement on April 15th, according to this El Comericio article, a Lima based newspaper. Negociations had been under way for quite some time, concluding on November 19, 2008 during the APEC summit which Peru hosted. The Australia-Chile Free Trade Agreement came into force on Saturday 6 March, the first trade agreement between Oceania and a Latin American country. Besides trade the agreement covers services, investments, government purchases and intellectual property plus a special chapter on academic and scientific cooperation. CARACAS – Venezuelan state energy company PDVSA announced the signing of a multi-billion-dollar joint venture with Portuguese, Argentine, U.S. and Japanese firms to develop massive offshore natural gas fields. The venture, in which PDVSA will have a majority stake, will design, build and operate two liquefaction plants at the Gran Mariscal de Ayacucho gas industrial complex in the northeastern state of Sucre, as well as pipelines to transport the fuel to those facilities. Mar. 8 - A former Bolivian vice president and known opponent of President Evo Morales said a government lynch-mob tried to burn down his house while his family were still inside. Helen Long of Reuters reports. LA PAZ – The former vice president of Bolivia and opposition leader Victor Hugo Cardenas complained on Saturday that a “government-party mob” attacked his house in a community on the Bolivian altiplano and fears for the life of his wife and three children who were staying there. Cardenas, an intellectual Aymara who was vice president during the first government of Gonzalo Sanchez de Lozada (1993-1997), told the media that peasant followers of President Evo Morales occupied at noon his house near Lake Titicaca.